1000W brushless DC motor with a rated speed of 3000 rpm and a rated voltage of 36V, 48V, long life and highly reliable. It is widely use in automatic machinery, medical institutions, electronic equiment ect..
110 mm square flange size, making it easy to install. Brushless design for long life. Hall signals for velocity feedback. The maximum torque momentarily impacts the load when the motor is started. Beyond this torque, the over-current protection of the driver will cause the motor to stop. 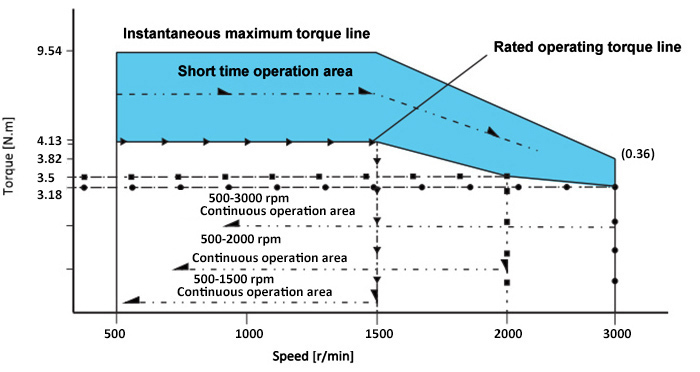 The motor can run at a short time within this torque range at different speeds. If the operation time is too long, the motor will generate heat, which may cause the motor to stop or burn. The rated torque of motor running at different speeds, and the motor can run for a long time at this torque. When the motor rotates at different speeds, it runs continuously in this corresponding zone. The maximum torque: Can be obtained by adding the load torque, moment of inertia and friction, in addition, there are some additional factors that affect the maximum torque, such as air gap air resistance and so on. Squared Modular Torque: It can be approximated as the continuous output torque required by the actual application. It depends on many factors: maximum torque, load torque, moment of inertia, acceleration, deceleration and running time. Speed: This is the speed according to the application needs, according to the motor speed trapezoidal curve to determine the motor speed requirements, usually leave 10% margin. Recently I have made several purchases from ATO.com. I have always received great service, quick turn around, and timely delivery of their excellent products like this 1kW 48V brushless dc motor. Nothing but positives in every aspect of conducting business. I highly recommend them! Very good BLDC motor and recommended controller, arrived on time with solid package.